Are You Sure that You Got It Right? Forage legumes such as alfalfa and red clover have long been recognized for their ability to enhance N availability to crops following them in a rotation. Currently, recommended nitrogen rates for corn following legumes in Ontario have been adjusted by using a credit system. Although the credit system approach is a good first step, it does not take into account the host of environmental, soil and management factors which can affect the actual availability of soil N and the degree to which the legume can be credited. This article presents data indicating the impact some common Ontario cropping sequences can have on soil N availability to corn and how a presidedress soil-N test (PSNT) can be used to enhance your ability to more correctly identify appropriate legume N credits. A research project, initiated in 1990, measured late spring (June 1) soil nitrate levels in the surface one foot on a long-term rotation experiment located at the Elora Research Station, University of Guelph. The rotations were comprised of two years of a rotation crop followed by two years of corn. The rotation crop sequences were soybeans-soybeans, soybeans-wheat, soybeans-wheat underseeded with red clover and alfalfa-alfalfa. Continuous corn was also included in this experiment. All crops in these rotations were produced using normal production practices for the Elora area in a fall moldboard plow tillage system. The alfalfa was planted in a pure stand which was harvested twice during the seeding year and three times during the second year. Figure 1 shows the average soil nitrate concentrations in the surface foot, measured when rotations were planted to first-year corn. First-year corn has been planted five times on this experiment since 1990, so the nitrate concentrations reported are an average of five years. 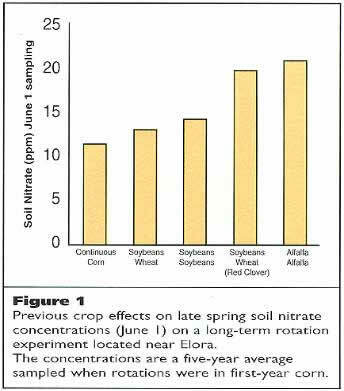 This graph clearly shows soil nitrate levels were higher following alfalfa and underseeded red clover, averaging about two times greater than where corn had been planted continuously. Based on these five year average soil nitrate concentrations, recommended PSNT fertilizer nitrogen rates are 110 lb-N/ac following corn, 85 lb-N/ac following soybeans or wheat, and 40 lb-N/ac following alfalfa or underseeded red clover. Unfortunately, year to year as well as field to field variations in soil-available N can be extreme, making accurate predictions of corn fertilizer N rates based on historic records or a simple credit system unreliable. The actual late spring soil nitrate concentrations from the rotation experiment for two of the five years (1996 and 1998) are shown in Table 1. Soil nitrate concentrations in 1996 were clearly lower than in 1998, illustrating the potential variation which can occur in late spring soil nitrate concentrations from year to year. 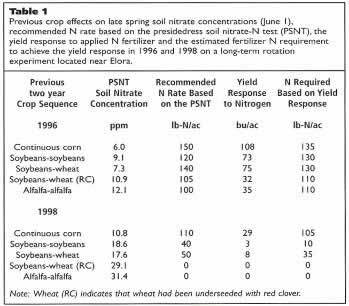 Table 1 also contains the yield response to fertilizer nitrogen which was considerably higher in 1996, further supporting the suggestion that soil N availability in 1996 was less than in 1998. The actual N rate recommended by the PSNT is also presented in Table 1. The PSNT clearly indicated that greater fertilizer N rates were required for all rotations in 1996. The last column in Table 1 is an estimate of the fertilizer N required to achieve the observed yield response to fertilizer N. This estimate is based on relationships similar to those currently used by some corn producers to estimate N rates from zero N strips. The recommended PSNT N rate and estimated fertilizer N requirement generally were quite similar, suggesting the PSNT was a good indicator of fertilizer N requirements following these rotations in 1996 and 1998. Nitrogen rates for normal yields in the Elora area based on OMAFRA recommendations (Pub. 296, Tables 4-4 and 2-7), are about 120 to 130 lb-N/ac, with a 90 lb-N/ac credit applied to perennial sod containing more than 50 per cent legumes. So, OMAFRA recommendations indicate that the appropriate N rate following alfalfa is about 30-40 lb-N/ac, a rate which the soil nitrate and yield response data presented in Table 1 suggests was not correct for either 1996 or 1998. On the other hand, the PSNT did indicate that N availability following alfalfa in 1996 was considerably less than expected and that the full 90 lb-N/ac credit should not have been applied in this year. It also correctly indicated that fertilizer N did not need to be applied in 1998 following alfalfa. The PSNT also correctly predicted N requirements following underseeded red clover and the other rotations as well. It should be acknowledged that there is some controversy about the ability of the PSNT to pinpoint corn fertilizer N requirements on the field scale. However, the test can be reliably used to obtain a general idea of the quantity of fertilizer N which will be required by the current year's corn crop. Accuracy of PSNT recommendations may be improved by dividing fields into management units with similar characteristics (based on elevation, slope position and texture) and sampling these management units separately (Pub. 296, Table 4-3). If the PSNT is used following legumes, best results will be obtained if stands were uniform. The reliability of the PSNT will decline if legume stands prior to plow down were spotty, and should be used cautiously in fields which did not have uniform legume stands. The PSNT should not be used in no-till systems where the legume was spring killed. The PSNT can be used when legumes were spring plowed, but there should be at least four weeks between the plow and sample dates before the PSNT will provide a reasonable estimate of legume N contribution. Soil-N testing should be considered part of an overall nitrogen management strategy and will help identify fields and years when fertilizer N is definitely not required, or can be applied at substantially reduced rates. Research was conducted by the University of Guelph under the direction of Dr. Tony Vyn through funding provided by the Ontario Ministry of Agriculture, Food and Rural Affairs.